Jeanne Van Staalduinen teaches at Terra Ceia Christian School in Beaufort County. Four generations of her family have been involved with the modest school, tucked neatly in an austere wedge of this historic slice of North Carolina, about 18 miles east of Washington. It’s a place not far from where the Pungo and Pamlico rivers empty into the Pamlico Sound. A place where things are serene, peaceful. Tightly knit. A great environment for learning and to explore one’s faith. An industrial solar farm, for instance, not only would interrupt the scene but also obliterate it, the school becoming a victim of the so-called green revolution. Van Staalduinen, like many residents of this sparsely populated corner of the county, are understandably worried. Their concerns aren’t without precedent, and, in the end, their efforts to stop the project may prove futile. Chicago-based Wilkinson Solar would build the 600-acre, 74-megawatt solar facility adjacent to the school. The project, with 288,120 solar panels, would be the largest solar array in North Carolina. An outside entity would buy the energy. A university or another large energy user, maybe. None of the power from the project would be used directly in the community. On March 13, Wilkinson Solar, through Raleigh attorney Henry Campen, filed with the NCUC a request to approve the Beaufort County project. The commission held an evidentiary hearing May 22 and 23. Attorney Dianna Downey and engineer Evan Lawrence represented the Public Staff of the utilities commission. Lawrence testified the project met all legal requirements, and the commission should approve it. He said environmental or appearance issues weren’t the responsibility of his office, and they should be addressed though the local permitting process and the environmental permitting process. Terra Ceia Christian School hired a lawyer to participate, but he was denied the chance to speak because the school failed to file a timely petition to intervene. David Butcher, who lives adjacent to the proposed project, did, however, file such a petition. Raleigh attorneys Brady Allen and Dwight Allen represented Butcher, whose children had gone to Terra Ceia School. Butcher said he is concerned for the students’ safety. Panels could break free in high winds, he said. Disrupting the existing drainage ditches would cause flooding, which also could affect his property. He worries about the financial viability of the school. A fear of the unknown, he said, may keep many parents from considering Terra Ceia. 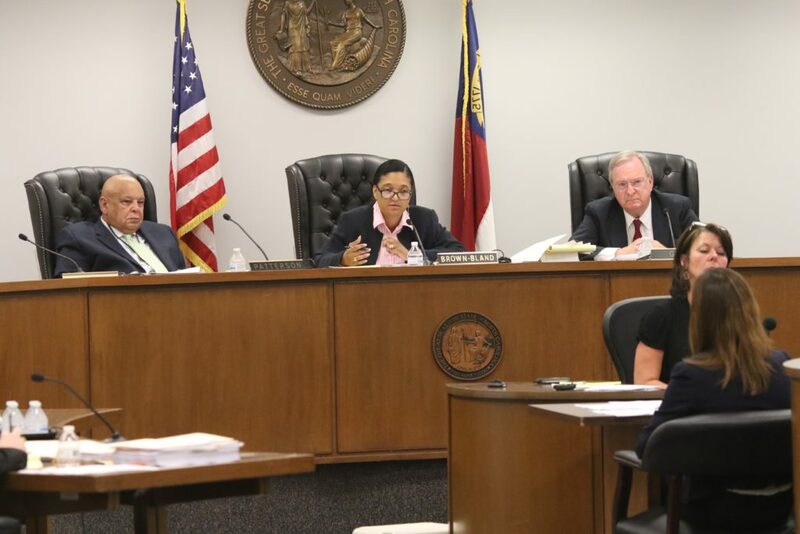 NCUC Commissioner ToNola Brown-Bland, who chaired the May 17 evidentiary hearing, agreed Terra Ceia Christian School is an important part of the community, and urged Wilkinson Solar and the school supporters to come together and coexist. Whether that happens is uncertain at best. The school goes back to 1937. It sits on 3 acres at Christian School and Terra Ceia roads near the community of Pantego. 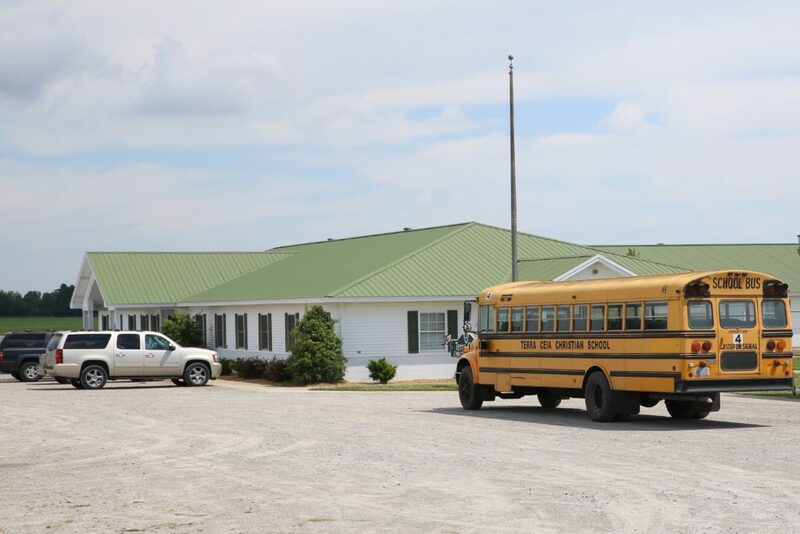 The school provides a Christian-based education for pre-kindergarten through 12th grade and has about 125 students from Beaufort and three adjoining counties. Standing near the school one has a clean view in all directions. Look north, and then east. Fields and farmland. Soon solar panels rising from six and 10 feet above the ground could scar that view. Wilkinson has approval from Beaufort County to proceed, but it must still get the OK from the Utilities Commission. That’s much of the problem, school backers say. The approval process is biased toward authorizing projects that satisfy technical requirements. It doesn’t allow much leeway to consider local opposition, potential environmental problems, or other effects on the communities where they are sited. “Butcher and Terra Ceia citizens know the area best. This case will set a tone nationwide for the media,” Brown-Bland said. Alan Meijer has four children at Terra Ceia Christian School. They live a mile from the proposed site. Meijer, who testified during the hearing, is the board president at the school, and his wife teaches there. “Permitting the installation of the proposed photovoltaic facility is simply reprehensible given the immediate proximity of a K-12 school, the potential harm to students and property at the school, and the topography, drainage, and soil qualities of the site,” he said. He, too, worries about flooding. “I’m concerned that any attempt to stop the flooding of the land where the photovoltaic facility will be located will cause water to be diverted past the school and cause flooding of our property and buildings,” he said. Meijer is just one voice against the project, though many others have joined the battle. In all 15 people testified May 17. They formed a powerful chorus. Eddie Ewell lives in Plymouth and is a youth minister at Plymouth Church of Christ. His four children attend the school. He speaks about the potential health risks. “We do not have enough evidence to feel that our children going to school in the middle of a solar panel field is the safest situation for them. If this project happens, we will be forced to remove our children from a school that we love, and I believe there are other parents who probably feel the same way,” he said. Wilkinson Solar LLC, is a subsidiary of Chicago-based Invenergy, an international renewable energy developer. Invenergy officials created Wilkinson Solar in June 2016 to handle the Beaufort County project. Invenergy has built one other solar project in North Carolina, the 20-megawatt Morgan’s Corner facility near Elizabeth City, completed in 2015. In 2011, Invenergy tried to build a wind energy facility in the same general area of Beaufort County as the proposed solar project. It abandoned that effort a few years later. Wilkinson Solar projects the facility would generate 175,376 megawatt hours annually. But, like wind energy, solar energy is inconstant and undependable. “Solar is an intermittent energy source, and therefore, the maximum dependable capacity is 0 MW,” states the application. Wilkinson officials said the project would only be built if it can secure a buyer who will sign a long-term contract for the electricity. A 35 percent state tax credit for solar and wind projects expired in 2015, but federal incentives are still in place. Another factor driving the demand for solar and wind projects is the desire by some organizations to claim they are investing in green energy to offset their use of electricity from more traditional sources such as coal, natural gas, and nuclear. In 2015, online retailer Amazon signed a contract with Avangrid to buy all the power from the 104-turbine, 208-MW wind facility near Elizabeth City that began operation this year. The power doesn’t go directly to any Amazon facility. Rather, Amazon sells it through the PJM Interconnection a regional transmission organization. The wind generated electricity does not count toward the renewable standards for any North Carolina electric utility. In October, three Boston-area entities — Massachusetts Institute of Technology, the Boston Medical Center, and the Post Office Square Redevelopment Corporation — contracted to buy all the power from the 60-MW Summit Farms Solar facility in Currituck County. The power doesn’t go directly to any of the three organizations. They sell it through the PJM Interconnection. 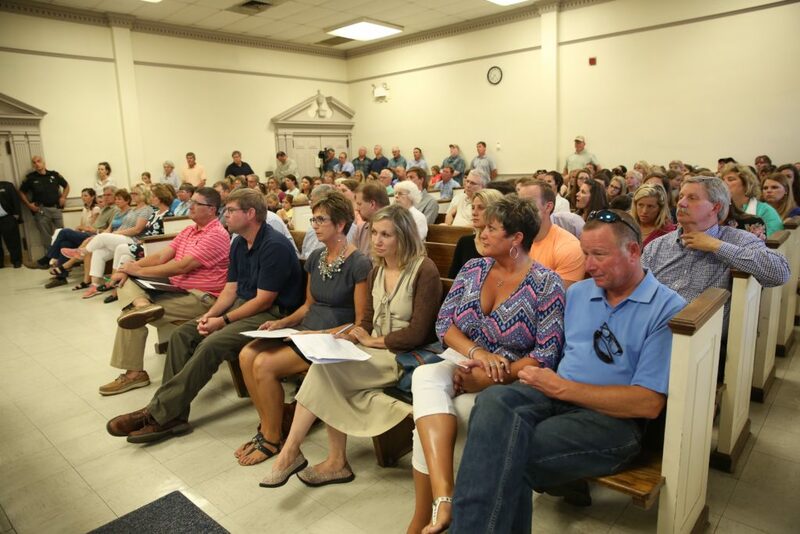 Residents and school supporters will continue to fight as they await a decision on Wilkinson’s application, expected sometime in July. Kenneth Leys was the administrator at the school for 24 years and continues to teach part time. “My younger students taught me how to Google, and so I Googled educational research on how solar panels affect positively the quality of education. I could not find one article,” he said. Another opponent, Jennifer Skvarla, wasn’t so blunt. But her plea came from the heart. “I know this school, I know this community, and I know that we will do everything to protect our children. When you take the children away, then you take the heart and soul of what we have stood for all these years,” she said.